I wasn't kidding when I told you guys I am obsessed with these J.Crew shorts. I got them in 3 colors! I don't ever do that but I where shorts so much in the summer and these are so flattering on me. I love the length! Red, chambray and leopard has always been one of my favorite go to combos. And I think if I could get away with wearing a hat everyday I would. This one from forever 21 is my favorite. It looks just like the J.Crew panama hat accept it is only $14! I love this round crystal bracelet from The bling bling on etsy. It is such a classic bracelet that goes with everything! And for only $24 it is so worth it! I am sooo happy it is friday! It has been a really weird week for me! Yay for the weekend! Love this combo! Chambray looks great on you! I love this outfit! J Crew shorts are the best. I got mine in 2 colors! Perfect shoes and bag! You look gorgeous! Love the outfit! the shoes are to die for! Those are great shorts. I bet you can wear them hundreds of ways. Such a cute look! Chambray and red is one of my favorite combinations. You look amazing! Ugh, kicking myself for not buying that shirt when I had it in my hand las week! The shoes, the shirt, the bag...PERFECTION. I love it. Loving your chambray top and fedora! 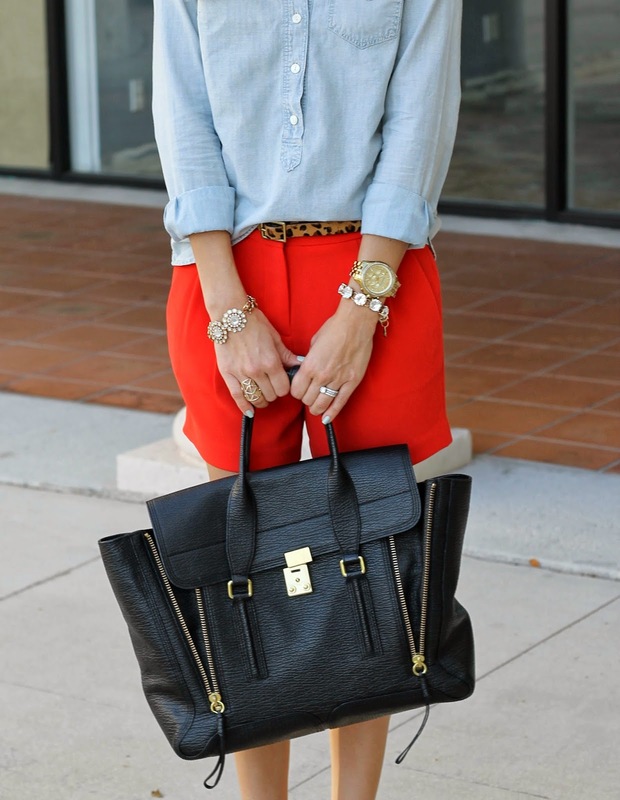 Love the chambray, red, and leopard combo! So unexpected, but it works so well! Woo your bling bling from Etsy is such a deal and looks way more expensive than what it had cost! What a great "resort" esque look today! Makes me want to take a cruise somewhere tropical! Hi! I am also from South Florida and I love all your outfits. I've been dreaming of those shorts for a while but I've heard they tend to run big... is that true? I also have some JCrew button downs and those also run big... please advise. Amazing outfit! Those shorts are really nice...wish we had a J.Crew close by!! this is a really cute look for summer! love the shorts! this red is so bright! Love the combination. Dreaming of a pair of those shoes. Your hair is so beautiful and it looks so shiny. Really like this outfit, especially the shorts!